The CG-500 CG Software & DeckLink 4K Extreme from Datavideo includes Datavideo's Windows-based CG-500 character generator software and the compatible Blackmagic Design DeckLink 4K Extreme PCIe I/O card. The CG-500 features a multi-layer, real-time workflow and supports play-out of multiple playlists even while titles are being created. It's ideal for live and post production broadcast programming in SD or HD. The DeckLink 4K Extreme supports 1080p 4:2:2 via single-link HD-SDI and 1080p 4:4:4 by dual-link HD-SDI. It also supports Component, Composite, and S-Video signals via an included breakout cable. 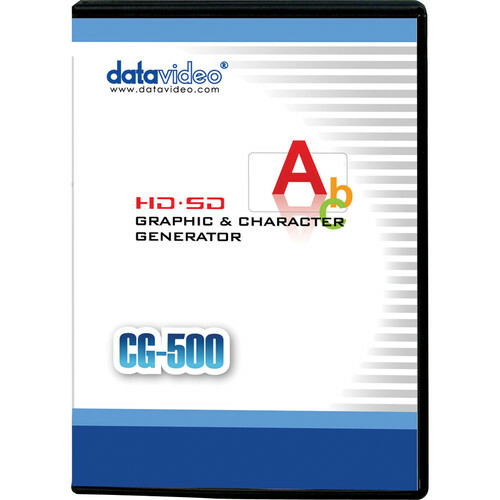 The Datavideo CG-500 HD/SD Character Generator Software is a Windows based graphics, titling, and character generator software for live programming and post production. It features a multi-layer and real-time workflow and supports flexible play-out of multiple playlists, even while titles are being created. It's ideal for SD or HD news, reports, weather forecasts, and entertainment programming. The Blackmagic Design DeckLink 4K Extreme Capture & Playback Card features two SDI inputs supporting 6G and 3G capability, assignable in the Blackmagic Control Panel. With all the latest firmware updates installed, you can ingest DCI 4K, 4:2:2, or UHD 4K, YUV, 4:2:2 by single-link 6G-SDI. The second input shuts off in this setup. DCI 4K, 4:2:2 can also be ingested via the HDMI input with the latest firmware installed. Box Dimensions (LxWxH) 7.5 x 5.4 x 0.6"
HD Down Conversion Built in, high quality hardware down converter outputs HD-SDI on SDI A output, SD-SDI on SDI B output and Composite and S-Video when working in HD video formats on playback. Switch analog video to Component and choose HD or SD output. Selectable between letterbox, anamorphic 16:9 and center cut 4:3 styles. HD Up Conversion Built-in, high quality hardware up conversion from SD to 720HD or 1080HD on playback. Selectable between 4:3 pillarbox, 14:9 pillarbox and 16:9 zoom. HD outputs via HD-SDI, HDMI and component analog. Box Dimensions (LxWxH) 9.0 x 5.8 x 2.8"
will the 4k extreme card export key and fill in sync ? Yes it would. The DeckLink 4k Extreme card uses RGB colorspace eliminating illegal 100% RGB video levels and allowing accurate fill and key output for external keying of graphics and animation.